Jeanettes mother treats their home like a whore house. Men pass in and out and it is only a matter of time before she is laying on her deathbed dying of AIDS. Her father already dead, alnd having no siblings Jeanette is no and orphan. She has no family to speak of. Despite making a promise to her mother to be a “good girl” the cycle continues and Jeanette makes big money by becoming a prostitute in the city. Chima is a village boy done good. He owns a shop in the village and is doing well, that is until he meets Nnena. 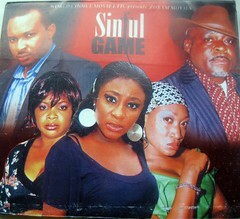 Nnenna is his money hungry girlfriend who ends up duping him. He gives her all his money to hold and she flees with it. With nothing to lose Chima follows one of his friends to Lagos to get his hustle on in the big city. His first job is cleaning cars in traffic. This is how he meets Jeanette. Jeanette and Akila as Chima is now called connect when he cleans her car windows in traffic. Feeling pity for him she wants to help him and gives him her card telling him he should call her should he ever need anything. They meet up and from there they become like brother and sister to the point that they refer to themselves as such. Akila fills a void in Jeanette’s life and for the first time in a long time she feels as if she has family. Oge Okoye I loved as the money hungry razz village babe. I was impressed with Chigozie Atuanya too. I have only seen him in slick village roles to it was good to see his versatility and booooooy did he play local like he had never left the village. One scene between the two that had me in fits of laughter was when Chima gives Nnenna 1000 Naira instead of the 15,000 that he had promised her. She searches him from top to bottom and finds a wad of money in his back pockets and starts a big ruckus about it before counting out 15,000 and leaving. Benita Nzeribe has put on a little bit if weight and she definitely looks better for it. Chima! What an idiot. You have seen from the beginning that Nnena is money hungry. The girl searched your whole person for money and grabbed it. The girl even sent her sister to pretend that she was sick and needed money for medicines all to extract money from you and then you go and give her your life savings to “hold.” Mugu! He even deserved to be robbed for such stupidity. One thing that I did not fully understand was Jeanette’s interest in Akila. I understand that she craved familial ties and he filled that void but WHY HIM and not one of the other car washers and why at that particular time in her life? What drew her him and why did she want an adopted brother as opposed to sister, mother or father? Did he remind her of someone? What was it? I ask this also because there was no obvious spark between the two on first meeting and it is important for us to see how their strong attachment formed. Even when they are supposed to have this strong attachment it does not ring true, He doesn’t behave like a brother towards her; in fact the way he is throughout is the way he is in the beginning, like she is a stranger. There is no chemistry between Akila and Jeanette so it doesn’t even make sense to me why she is acting all emotional over the guy. Is it bad casting or was this behaviour intentional on the part of the filmmakers? Perhaps it will become obvious in part 2 why Akila is quite nonchalant towards Jeanette despite everything that she has done for him. The movie starts off badly in that the credits roll in different fonts and sizes. Fonts styles and sizes should be kept consistent. If the first thing a viewer sees is messed up credits it sets in your mind that if even simple credits can’t be got right then the rest of the film must be equally as shoddy. More and more we are getting less value for money. They are splitting films up into smaller and smaller parts in order to get more money from the viewer, both parts of this movie amounted to about an hour and a half and then we see the advertisement for the continuation “A Brother.” Realistically both films should have equated to 2 parts not 4 parts. We also see “Coming Soon HOMOSEXUAL FATHER, SISTERS SOUL” trailing across the bottom of the screen. It is so annoying. I would however recommend this movie. It was entertaining and I loved the village scenes at the beginning of the movie in particular. There is a good build up suspense throughout the movie and even though you will probably be annoyed that the movie ended as it does, when you see the preview for “A Brother” you will be dying to see what happens next. The razz village babe Nnenna is back on the scene and I’ll definitely be watching to see what drama she brings!